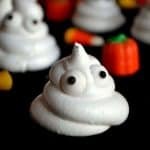 Halloween Ghost Meringues – a dairy-free, gluten-free, easy and adorable Halloween treat that your little goblins will love. *this post was originally published Oct. 10, 2011, but has been updated in format and pictures. That’s what this post is. Since it’s been four years since I originally published this, I figured it was time for some new pictures while keeping a few of the old. I also wanted to provide you with the same recipe format as my recent posts. I lightly adapted this from The Martha Stewart Living Cookbook, pp. 642, 515; author, Martha Stewart Living Magazine; publisher, Clarkson Potter Publishers, an imprint of The Crown Publishing Group, a division of Random House, Inc.; ISBN 978-0-307-39382-1. 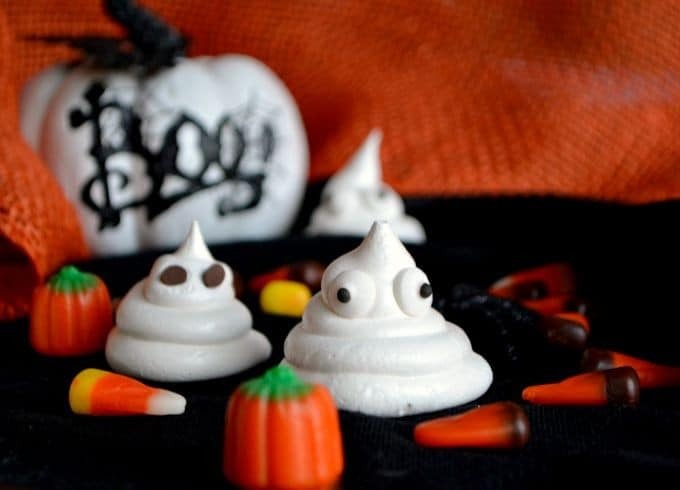 An dairy-free, gluten-free, easy and adorable Halloween treat. The kids will love them! Preheat oven to 175 degrees F., and prepare a cookie sheet by lining it with parchment paper. Fill a medium saucepan with a couple inches of water and bring to a simmer over medium heat. 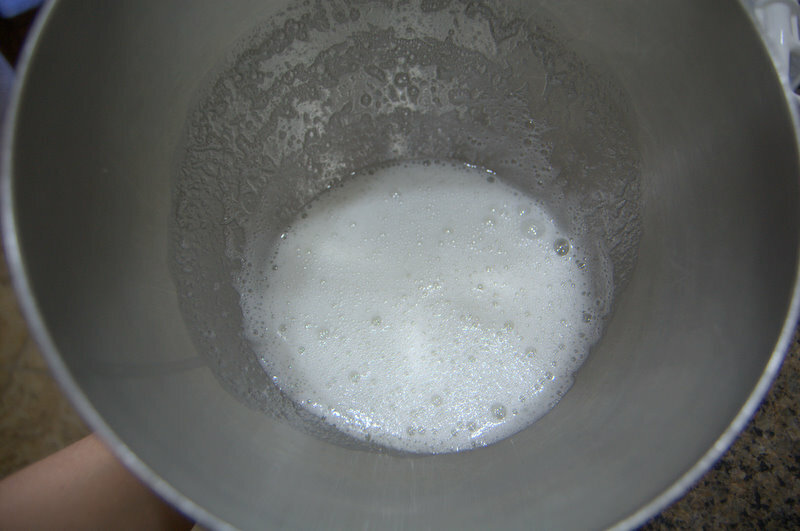 In a heat proof mixing bowl, combine egg whites, sugar, and cream of tartar. Place bowl over saucepan and whisk constantly until all sugar is dissolved and egg whites are warm. This will take approximately 3-4 minutes and can be tested by rubbing the solution between your clean fingers. It should feel smooth to the touch. With the wire whisk attached to the mixer, place bowl in mixer and beat on low speed, gradually increasing to high. Beat until whites form stiff and glossy peaks about 7 - 10 minutes. 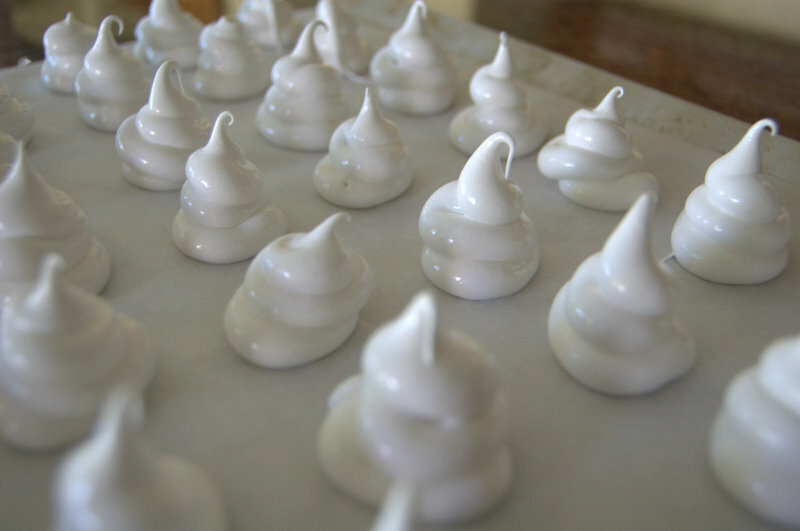 Fill a piping bag fitted with a Wilton #12 decorating tip with the meringue. On your prepared cookie sheet, form a circle by moving the piping bag in a clockwise motion and pull up on the bag, forming a peak at the end. Use the candy or mini chocolate morsels for the eyes. 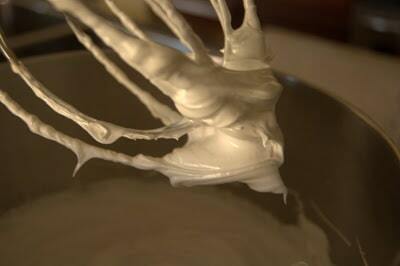 Turn oven off and allow meringues to remain in oven for another 4 hours before serving. Pictures and the rest of the old post follow below. It’s kind of cool to see the old ones, but I like the new pictures much better! 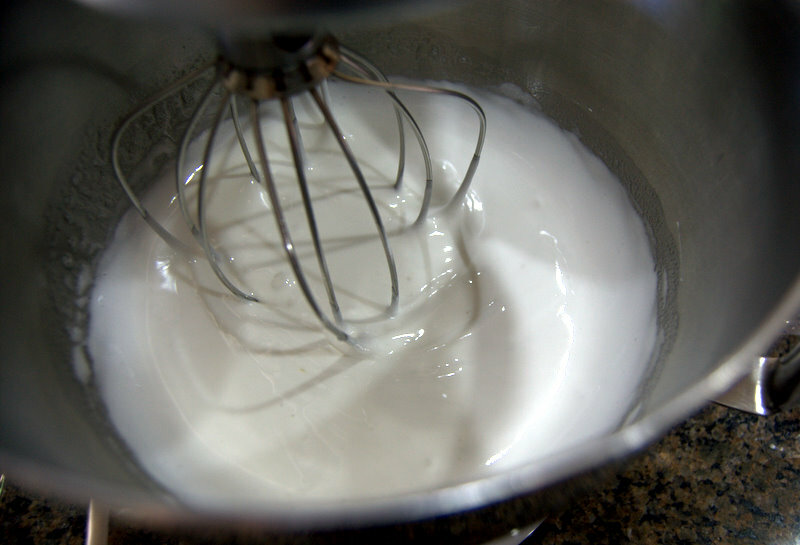 Combine the egg whites, sugar and that pinch of tartar into your mixing bowl. 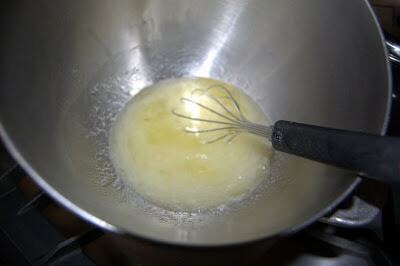 Place the bowl over the saucepan and whisk constantly until all sugar is dissolved and egg whites become warm. It will take approximately 3-4 minutes and can be tested by rubbing the solution between your fingers. It should feel smooth to the touch without feeling the sugar granules. Beat on low speed, gradually increasing to high. Beat until stiff and glossy peaks form. 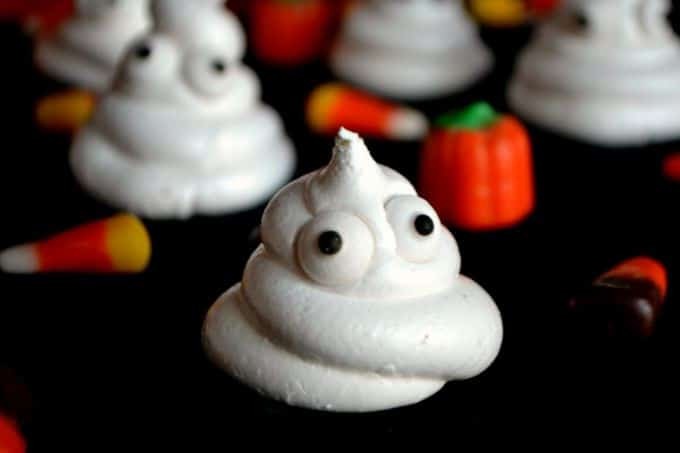 Then, you’re going to fill a piping bag fitted with a Wilton #12 decorating tip with meringue or a tip that has a round end that is 1/4-inch in diameter. Now, on the cookie sheet, form a circle by moving the piping bag in a clockwise motion. Pull up on the bag, forming a peak. 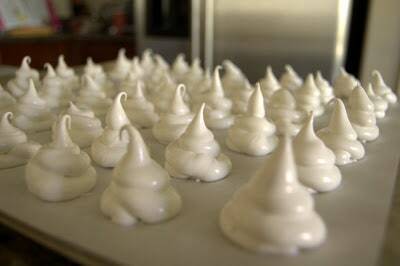 Turn oven off and allow meringues to remain in oven for another 4 hours. Don’t worry, “patience comes to those who wait”, right? 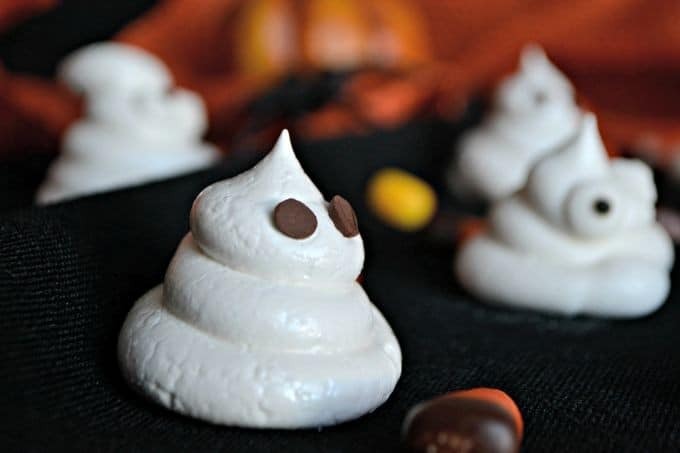 You now have some Halloween Ghost Meringues! 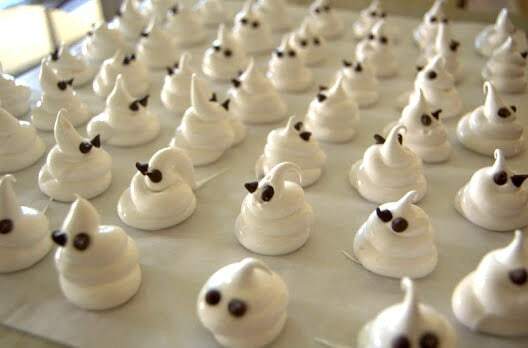 I rate everything I bake on a scale of 1-4 with 4 being the best and these Halloween Ghost Meringues earned 3 1/2 rolling pins. They tasted like hardened marshmallow fluff, only better! I had made some with the mini chocolate chips and some without and the ones with the chocolate we liked better. Chocolate is always a good addition! Oh, remember yesterday when I talked about the Cross Country race that our son was running in today? He finished at 18:15, not under the 18:00 minutes as he had hoped, but overall the boys’ team finished 4th and are headed to the State meet next Saturday! We were also excited because one of our runners finished 2nd overall, running a 16:24. Both the boys and girls did very well. Unfortunately, the girls did not do as well as they had hoped, but they are not losing any seniors this year. This was also the first year running varsity for all of the girls with the exception of one. They all set personal records and had a great year. SO proud of all of the team members!! Won’t the chocolate morsels melt while baking? Patricia, they do not because the temperature of the oven is low enough. I forgot to add vanilla will they still taste ok? Bridgett, I think they should be ok. Of course, they won’t have as much flavor but they’ll still be edible. I’d be much more concerned if you’d forgotten the sugar which in that case, I’d recommend starting over. Wow are these delicious and easy to make. My spouse kept eating the ‘ugly’ ones so no one else would have to, LOL. Mine needed a little longer time in the oven during the cooking phase but maybe that was because I made a double batch and used 25% less sugar. They still tasted deliciously sweet. So glad you enjoyed them and thanks for the tip about the sugar! Gracie, sorry about the late response. You should preheat the oven at 175 degrees F.
Lynne, these are the most adorable little things! 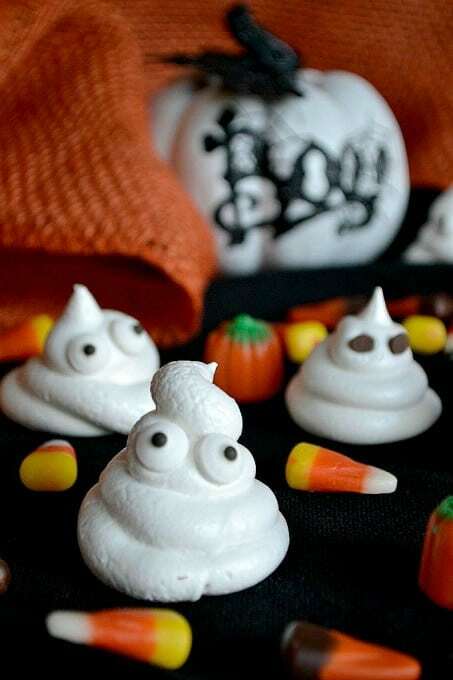 So cute and clever, I’m definitely making these for Halloween! Thanks so much, Joan. They were fun to make, and so cute we almost didn’t want to eat them!